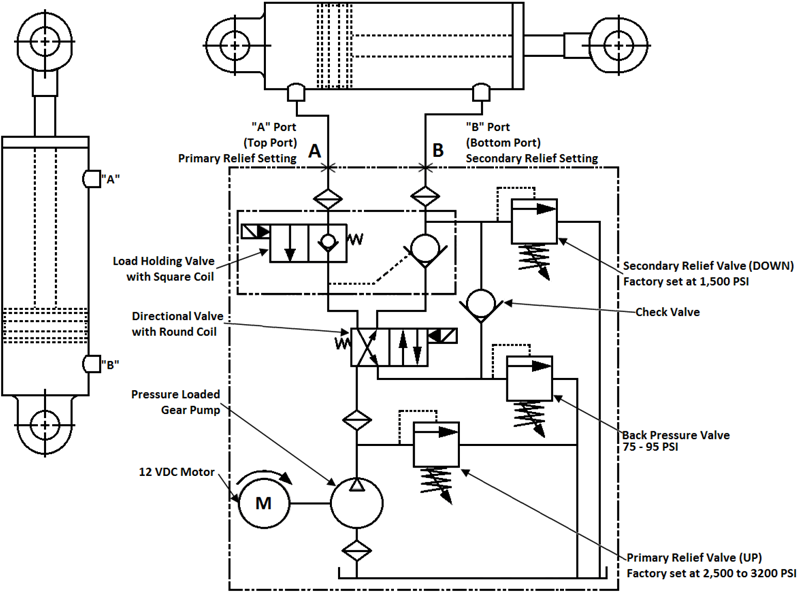 Installation Instructions: 12 VDC Single Double Acting – KTI Hydraulics, Inc. Remove the Three-button pendant from the power unit at the quick disconnect. 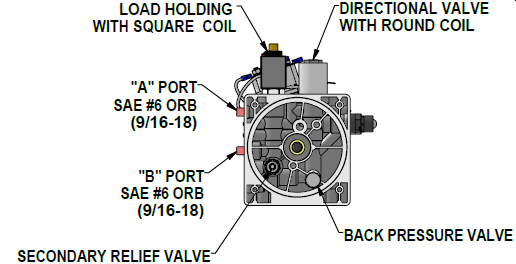 Install 9/16-18 SAE ORB, SAE #6, hydraulic fittings into ports “A” and “B”. Torque fittings to 18 ft.-lb. Mount the Power Unit using two, 3/8-16 UNC mounting bolts (Diagram A-3). 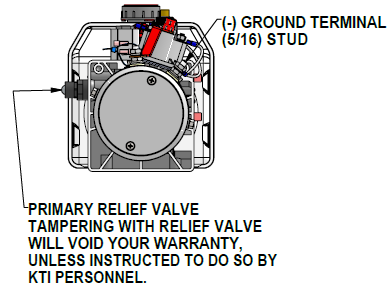 Remove the Filler/ Breather Cap, then fill the reservoir to the “Full line” labeled on the side of the reservoir. Fluid level should be approximately 1 inch from the top of the reservoir. (Please see fluid recommendations). Connect the battery Ground cable to the Ground terminal of the DC Motor (diagram A-4). 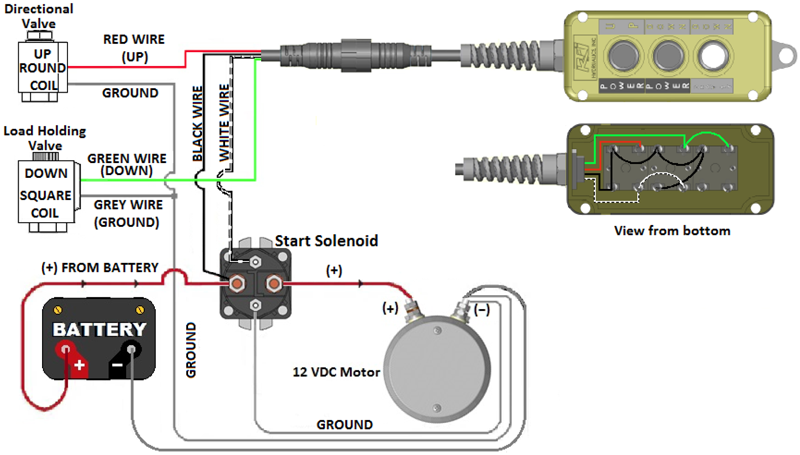 Connect the Positive cable from the battery to the start solenoid (diagram A-5). Please see Battery Cable recommendation (page 3) for proper cable length to use for your hydraulic power unit. Reconnect the three-button remote pendant at the quick disconnect. 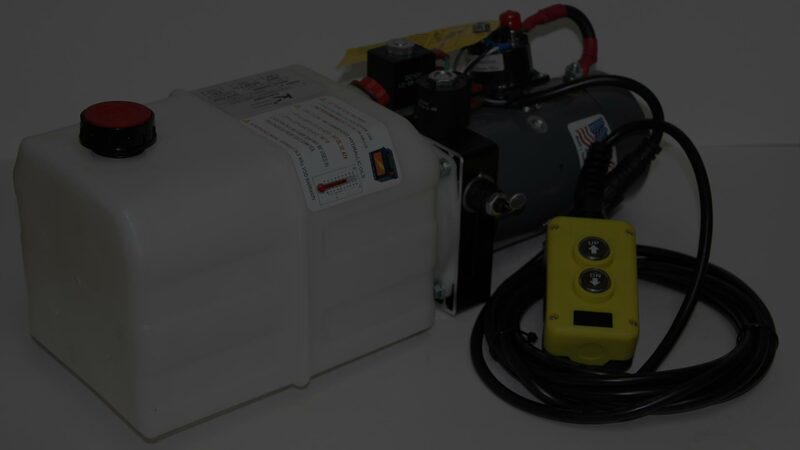 Operate the power unit while keeping an eye on the fluid level in the reservoir.a. Insure that the fluid level doesn’t go lower than 1⁄2 full during the initial start-up.b. When the cylinder is fully extended, the reservoir should be about 1⁄2 full. 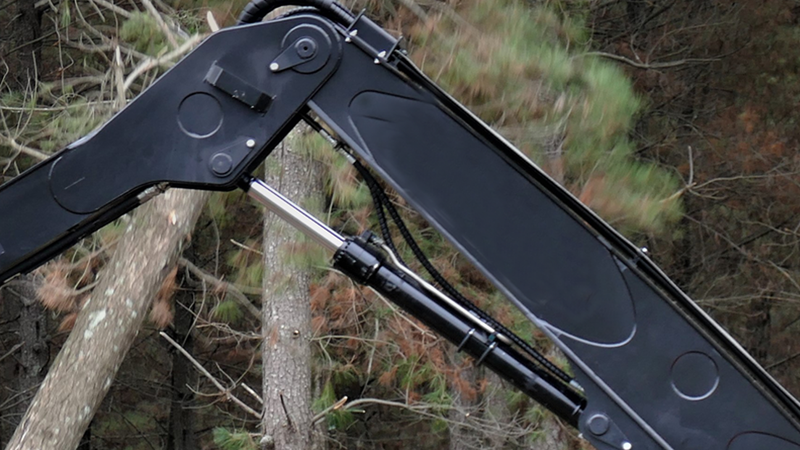 Please Note: When running your hydraulic power unit for the first time do not allow the fluid to drop below the half full level, while raising or extending the hydraulic cylinder. This will cause the power unit to induce air into the system. During activation of the down function, the air in the system will cause aeration of the fluid and overflow the reservoir tank. 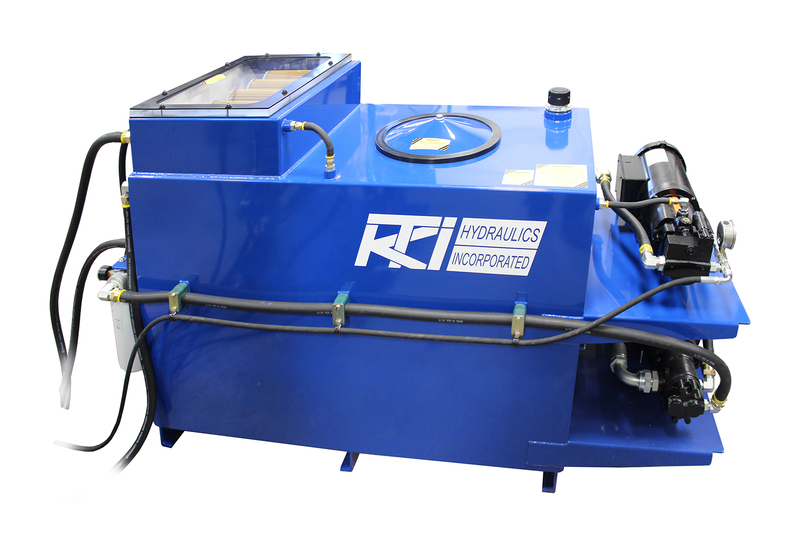 c. Refer to the Bleed Cycle Procedure Instructions to purge air from the hydraulic system. 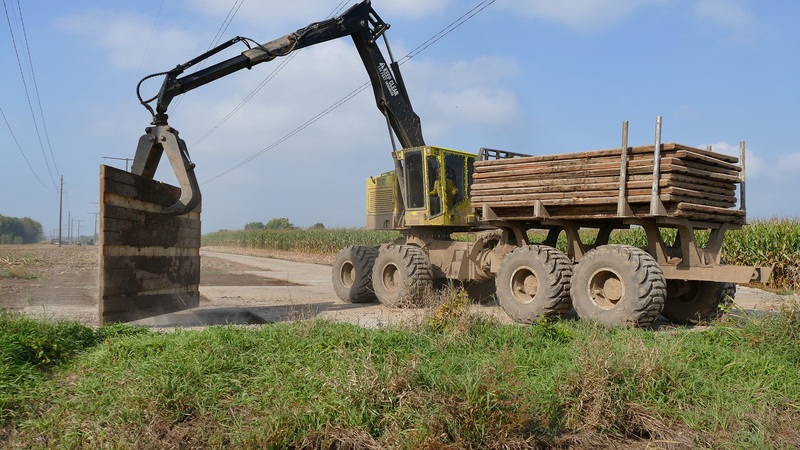 KTI recommends using a premium hydraulic oil to ensure optimum performance and system life. Select oil that has anti-wear properties, rust and oxidation inhibitors, foam inhibitors and good stability. Examples of premium grade hydraulic oils: Chevron Rando HDZ, Mobil DTE 10, DTE 20 series, AMSOIL, and Shell Tellus. Automotive Transmission Fluid (DEXTRON III) are acceptable under normal conditions. Aviation Oils such as Valvoline ROYCO series or Mobil Aero HF or HFA may be used in prolonged, extreme cold environments.